Passed February 9, 2019, peacefully, much-loved mother of Henry, a devoted grandmother and great-grandmother. Funeral Service to be held at 1.00 p.m., on 14th February in Wilton Funeral Home, 298 Shore Road, Whitehouse, BT37 9RW and afterwards to Carnmoney Cemetery (East). Family flowers only. 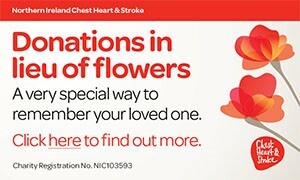 Donations in lieu, of flowers, if desired, to Marie Curie, 60 Knock Road, Belfast, BT5 6LQ. Deeply regretted by daughter-in-law Julie, granddaughter Ashley and grandson Cameron. Deeply regretted by her friend Sally and the Steel family, Dollingstown. For a dear friend who will be sadly missed, peace is yours, memories mine. I am sorry to tell you that Helen CHRISTIE has passed away.